The low mountain that beckoned me to question my priorities in the A. Way. 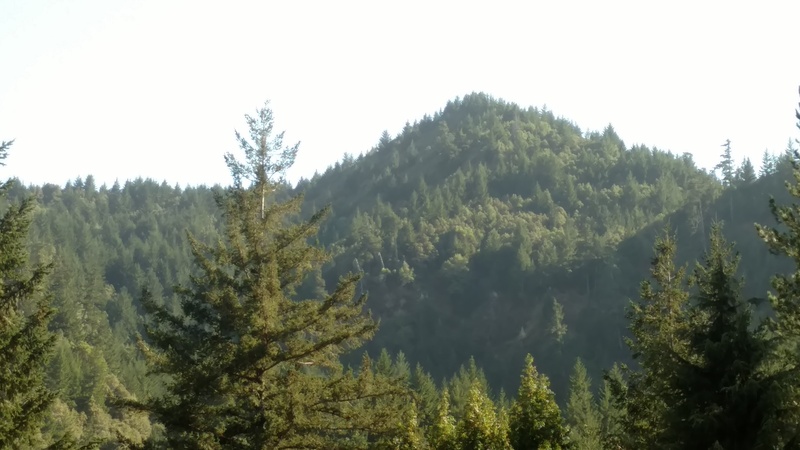 This is the second post detailing my introduction to qualitative field work in the Mattole watershed. To read Part 1, click here. Following the end of the community forum which I describe here, my cohorts and I headed to what would become our home for the week. We were staying at the A. W. Way Campgrounds, better known as the “A Way.” It was a pleasant location, mostly open, but with enough trees to provide some shade. We decided to stay in a quiet, out-of-the-way section that contained a good amount of greenery. We pitched our tents, and then most of my cohorts left to check out the nearby swimming holes. However, I decided to remain behind. I had been carrying a study about the Eurasian lynx (Lynx lynx) in my backpack for months, and I decided that this was the perfect time to read it. So I sat down on a nearby bench and began transporting my mind to the Swiss Jura Mountains. But it would not stay there for long. Upon glancing up, I was suddenly confronted by the splendor of my surroundings. Looming over me was a low but imposing mountain, flanked on either side by tree-covered cliffs. They were simultaneously intimidating and welcoming, and I was impressed by their beauty. But I also felt ashamed. Here I was, engrossing myself in a far-away landscape, while ignoring the natural wonders around me. This is an issue that frequently haunts my mind. Why am I so obsessed with “exotic” animals like jaguars, when the wildlife in my area is just as fascinating? By always chasing distant goals, by always trying to keep moving, am I blinding myself to the opportunities before me? I wonder if keeping my eyes locked on the road ahead is leading me to miss the metaphorical mountain right beside me. Another shot of the mountain in the featured image, this time showing the surrounding cliffs a little better. But my pondering could not go on forever. Before long my cohorts returned, and we had a delicious and light-hearted dinner. A remarkable woman had cooked it and driven all the way from Arcata (a journey of multiple hours) to bring it to us. I do not want to share her name to respect her privacy, but if you happen to be reading this, know that I am grateful! Then after a bit of socializing, my cohorts and I passed our first night in our new home. 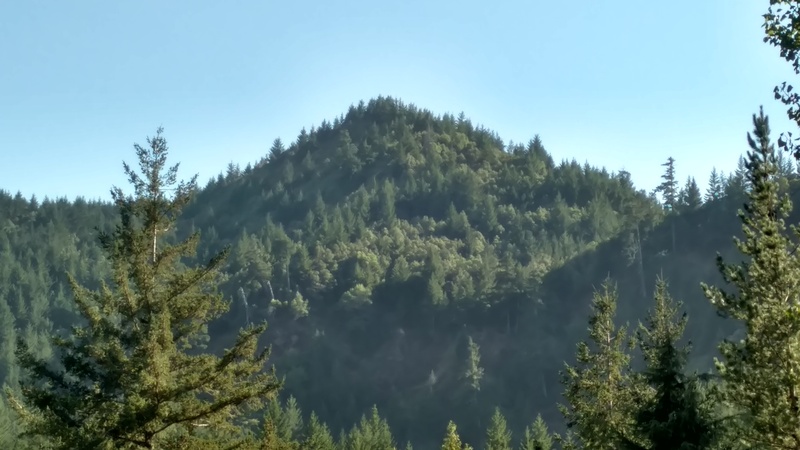 We had had a full first day in the Mattole, but day two would prove just as eventful. I apologize for how long it took me to publish this post. I am much busier than I was during the summer due to school, and I must not fall too far behind on more cat-related posts. Therefore it might take me some time to finish this Mattole series. It’s natural we block our own minds when we put all our heart in something, seems we lose what we have around. I feel you. También, es bien si me escribas en español. Puedo usar la practica, ya que no tengo mucho tiempo para ello en este momento. Agradecería por alguna oportunidad para practicar! A menos que preferirías usar inglés, por supuesto. Mi experiencia dice, consentirse un poco no significa olvidarse de la meta, es decir, a veces necesitamos de distracciones para poder volver a lo nuestro con mayor fuerza. En español entonces, encantada de ayudar. Gracias Paula, es verdad lo que dices. Lovely. I can so relate to your comment about exotics vs. our bioregional landscapes. As much as I love the Pacific NW, and feel we, as Americans, need to be much more boots-on-the-ground about making our country work right now (in many ways), I was very compelled recently to jump on a plane and work for the orangutans. But I didn’t. I often deal with that tension too. As visitors to this blog can probably tell I feel a personal connection to jaguars, and I’ve wanted to visit the Amazon for years. But there’s so much amazing wildlife throughout the US (including at least one jaguar), and I often feel like my ultimate priority should be to focus on more local conservation issues. Wow, thanks Mithai, I needed to hear this. I go back and forth on this a lot, but I just can’t give up on my desire to contribute to jaguar conservation in a meaningful way…maybe even in Guyana. I don’t know if I’ll be able to make it work anytime soon, but eventually I hope I will. Thank you I’m glad I could help in a small way :) But my mood is just baaad!! My laptop is dead. And I gotta buy a new phone soon. The good this amongst all this is I got two jobs. But I just hate those jobs!! Writing programs sitting in front of the computer for 7-8 hours a day!! I’m just tired even with the thought of it!! Oh no, that sounds horrible! Working at jobs you don’t like can be draining. It sounds like you need to make money (don’t we all), but that the jobs are really boring for you. That’s right, I forgot you started a business! That would be so exciting, to be able to make a living off of the business that YOU created! I really hope you get to focus more fully on it soon. Y no tenés por qué estar avergonzado, es normal que pase eso, uno vive a las apuradas por la forma de vida que actualmente se tiene y es difícil parar a veces. Lo importante es detenerse, darse cuenta, y disfrutar esos momentos :) porque no suelen aparecer seguido! Te mando un beso grande :) y valió la pena la espera! Sí, es fácil pasar por alto las maravillas que nos rodean cuando estamos ocupados. Pero fue lindo pasar algún tiempo simplemente disfrutando mis alrededores. Hablando de estar ocupado, responderé a tu email pronto, con suerte hoy. No he olvidado! Sii, lo importante es aprovechar esos momentos :) a mi no hay cosa que me tranquilice mas que eso! Tranquilo Josh, no hay problema :) yo también estoy a mil! It’s true but when you do recognise the metaphorical mountain that was right beside you all along it’s an amazing moment! Gratitude really does inspire and attract more abundance. Thanks Faatima! I suppose your right: if I hadn’t noticed that mountain so suddenly it might not have left such an impact on me.